My refer takes hours to get cold when first plugged in. If I start it the night before on propane about how much propane would it use? ANSWER: Hi Glen, I am happy to tell you that running your RV's refrigerator on propane for 24 hours to get it cold will barely use any propane. 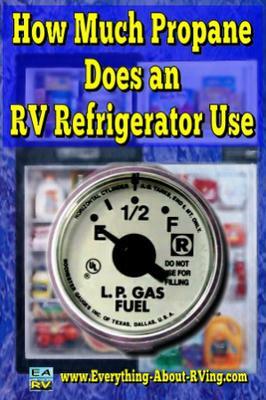 In fact you can run your RV's fridge for several weeks before you will even see the propane gauge show any change. Most Refrigerators that come in RVs are Absorption Refrigerators . They are not like the fridges in your home that use electricity to run a compressor and fan system to keep your fridge cold. I will try not to get too technical here; Absorption Fridges are sealed systems with no moving parts. The system uses a combination of Ammonia and water that needs to get heated up to a boiling point in what is known as the generator in the sealed system. When the water and ammonia begins to boil they pass into a Separator which separates the water from the ammonia. The water and ammonia now start their separate journeys through the absorption system. The water moves on to an Absorber. The ammonia takes a trip to the Condenser, where the Ammonia gets to cool down and return to a liquid state. The ammonia then goes to an evaporator where it combines with some compressed hydrogen gas and evaporates into a very cold vapor. This cold vapor moves to cooling coils that are inside the refrigerator, cooling the interior of the refrigerator starting with the freezer. Finally the vapor goes to the Abosorber where it mixes back in with the water and the whole process starts all over again. is available and propane when electric is not available to run the the cooling process. The amount of propane needed to run this absorption process is minimal, so you will not see a large amount of propane being used by your fridge. In fact most RVers start their fridges the night before they are going to start their trip, as an Absorption Fridge takes a good 24 hours to get cold. In most cases the freezer section of the fridge is the first part of the fridge to start cooling down. Also the hotter it is outside the longer it will take for the fridge to get cold. Below are some steps you can take to help your fridge get colder sooner and how to keep it cold during your travels. 1. Make sure that the refrigerator is level. The cooling process of the fridge depends on gravity and if your refrigerator is not level it will not perform efficiently. 2. Most RV refrigerators do not have fans inside to circulate the cold air around the food in the freezer and refrigerator section. You should purchase a couple of battery operated RV Refrigerator Fans . These fans should be placed in the bottom of both the freezer and fridge section of your fridge. The fans normally run on D Cell batteries and do a good job of circulating the air in the compartments. The batteries usually last over a month. 3. Don't over fill the compartments in the fridge. You need to leave some space between the food items so that the cold air from the fridge can circulate. 4. A properly maintained refrigerator will work more efficiently. Take a look at the video below for some tips on how how to maintain your fridge. What about the batteries when using propane? They don't last forever, even if the propane does, so if cooling down the refer before traveling, how much battery is it taking? As for your 6.2 norcold 12 hrs on 30amp to get cold. Thanks for the tip to stay with dometic. On 110V mine will freeze ice in 3 hrs from plug in. As far as the non-ducted a/c noisey as a concert. My old motorhome had non-ducted TV had to be full blast to hear. My current dometic 15000btu duo therm ducted is WISPER QUIET ! I'd trade that trailer off. I did because camping is supposed to be as enjoyable as possible. A relaxing time isn't an a/c unit at 100 DB. A tip for your camp trip. Plug in your trailers power to the house and use your 110V powering up your fridge till your ready to leave. Typicly my 110V cools down the fridge in 3 hrs freezing ice too. Just unplug your power when ready to leave most refers change over to propane automaticly. Don't forget to turn on your propane. Each gal of propane equals 91,503 btu. A 20 lb propane tank holds 4.7 gal for a total of 430,064 available btus. My fridge use 1,500 btu's per hr or 36,000 btu per day on propane. Dividing the total btu by usage equals 12 days of constant use per propane tank. 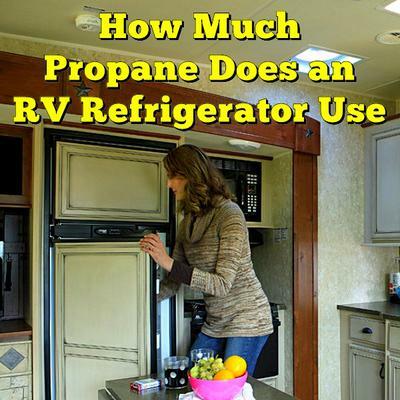 But the only time we use propane is when prepping for a trip and travelling. Once we set up camp the fridge runs on electric. Hope this helps. And that my math is right. There was no specific amount provided for use on an avg RV fridge. I am looking for either a tank or portion per 24 hour or cubic ft amount. I did find my 6.2 NoCold took 12 hour to cool on 30 amp and still trying to figure how long on propane. Guess I will continue a search elsewhere. Also two other comments from a new RV person. 1. The air conditioning in my trailer is very loud and we did not know when buying. Coleman needs to figure something out for a non ducted system like a mini split. The best bottles to,carry water in are bleach bottles. Rinse them out after you,have used all the product and fill with tap,water.any residue left will keep water fresh for months and they will not be any taste. Also pour a small amount of bleach in the fresh water tank if your RVhass been setting for a long time it will freshen any water that remains. Re: the comment using milk jugs as potable water jugs. DON'T DO IT! Any container originally holding dairy products is unsuitable for later use as potable water storage. Apparently the dairy product cannot be fully cleansed from the container; microscopic pieces remain no matter how, or how often, you clean the container. So go ahead and use them as ice blocks, but don't drink, or allow pets to drink, the defrosted water. Instead, use the water to wash yr hands on a hike, or water yr RV house plants, or rinse the kids feet on the beach, etc. To make potable water ice blocks, use well washed soda bottles or reuse water bottles. We can not turn on frig LP 24 hrs in advance. So, we buy small amount of dry ice take it to RV in cooler and load in frig freezer to accelerate the cool down. The comment which popped up when I tried to run the video says: "No Video." ? ? ? I don't know it it works but I use ice block from freezing milk carton or jugs to cool the frig and freezer faster. I wash them up and fill them with water and freeze in the chest freezer in the house. I put then in the frig and freezer when I them on. I use the defrosted jugs of ice/water for the dogs water dishes or to cool the coals before we got to bed. A few of the jugs of water I fill with filtered water to use in the coffee pot. I also freeze small water bottles (you have to open them and remove about 1/2" of water) to take along on day trips. The bottled water melts slowly and stays cold for a long time. I just refill them with water from the jugs and freeze. I rotate frozen bottles of water from the frig to the freezer and back to the frig to help keep both cool on hot days.